His ‘code name’ could be mistaken for the name of a rifle: P183. 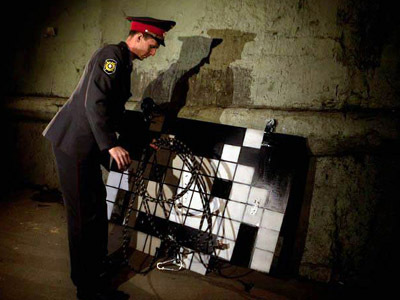 The covert graffiti artist, often referred to as ‘the Russian Banksy’, has died. 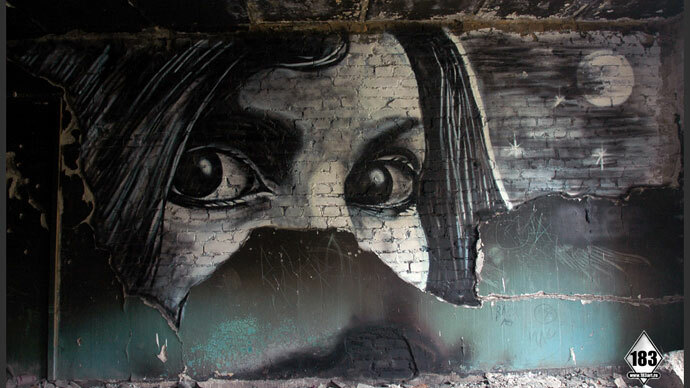 Pavel won recognition as the creator of provocative art works scattered across Moscow. The details and conditions of the ‘Russian Banksy’s’ death will not be released, the production company Pavel worked for, said in the statement. Preliminary theories, however, rapidly spread online with people saying that the graffiti artist hanged himself. At the same time the media, referring to street art group ‘310’, said he was poisoned. Not much known about the artist who preferred not to disclose his name and signed his works like P183, besides his name – Pavel Pukhov - and age 29. P183 went international after several British, American and French dailies published photographs of his works, saying his ‘guerilla’ tactics of painting street murals were similar to those used by iconic British nonconformist Banksy. However, P183 didn’t take the comparison as a compliment, noting he had been shaping his signature style for the past 14 years. The mysterious figure, allegedly in his late 20s, preferred to cover his tracks and hide his face with a black balaclava to remain anonymous. A can of spray paint never failed him, helping the up-and-coming artist share his ideas with those who kept their eyes wide open. Last April, Pavel pulled off his most daring stunt, which provoked panic among the city’s police force. An area in an industrial zone in Moscow was cordoned off and a bomb disposal team was called in after a report came in of a suspicious object underneath a railway bridge. Much to everybody’s surprise, instead of a bomb the police detected a model of a space invader from the popular 80s arcade video game. It featured a robot imitating the game by shooting passing cars with a red light laser. But no harm was caused to the cars or their drivers. “Who could have possibly mistaken a two-meter-wide space invader for a bomb?” Pavel wondered. “What astonished me the most is that when media reported this, they had a picture of actual grenade next to the text. You’ve seen the reaction of the people in the video recorded – it made them laugh! No one was suspicious about this!” the artist told RT. Many called Pavel a graffiti vandal. But with his pieces lasting more than a few days before being removed by street cleaners there was always more than meets the eye. Photographs often became the only way they could be captured for posterity. The elusive artist studied communicative design at college. Abandoned buildings, bridges, schools and the Moscow Metro were his creative ‘playgrounds’. The artist often put freedom under the spotlight, as well as civil activism. One summer Pavel painted riot police on a Metro entrance, in a bid to relive the days of the 1991 attempted coup. Shortly after the 2011 December's State Duma elections, which were wrought with claims of electoral fraud, he ventured into politics. “Expressing your opinion is a form of civil defense,” the artist believed.